Finally something for the guys is now posted in my shop! Something for the guys or anyone who wears ties! 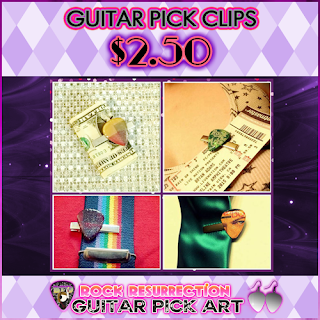 These also look cool clipped on jackets or suspenders.They feature a few different creations, all made from re-purposed materials. Top: David Bowie "Black Tie White Noise" tie clip, Red & Gold re-purposed material tie clip, a Yoda clip SOLD OUT and a Red sparkle guitar pick tie clip.